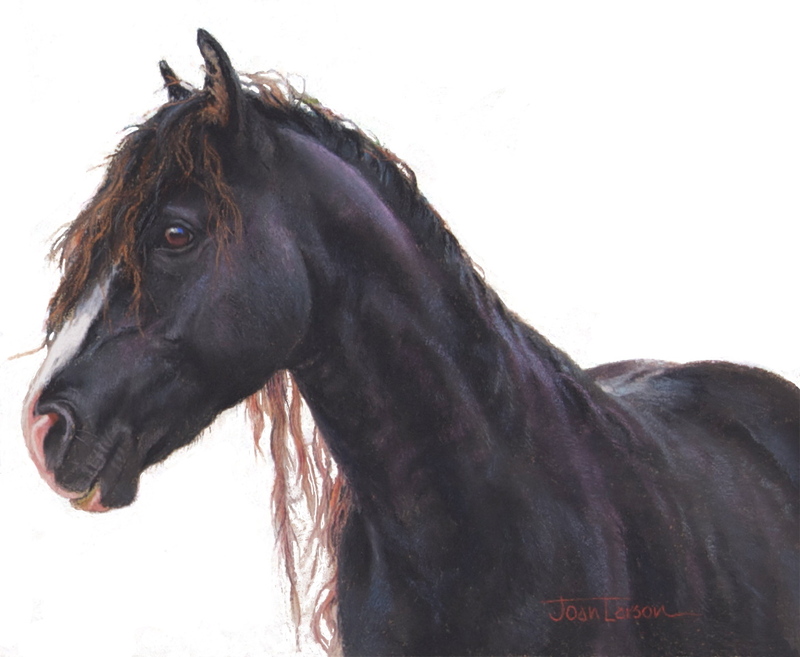 Back by popular demand – an Art of the Horse painting workshop with Joan Larson at Twincreeks! This is a 2.5 day, in-residence, workshop including live observation and sketching lessons as well as studio work. All levels of experience are welcome – everyone learns something. Joan will demo in pastel, however you are more than welcome to bring the painting medium of your choice since she is well versed in many mediums. Saturday & Sunday: Full day painting with potential for evening ride. HORSES WELCOME – at no extra charge! After the initial Sable Island show at the studio on the 18th and 19th of June, Pamela Smyth, from the Oceanside Star came by the Studio and then wrote this article in the local paper. Thanks so much Pamela! Joan Larson unveiled her Sable Island series at the Creekside Studio in Combs last weekend. The series follows her equestrian-themed Musical Ride series, released earlier this year. In 2009, Larson’s passion for horses drew her to the island off Nova Scotia’s southeast coast and home to over 350 shipwrecks and 400 free-roaming feral horses. The nomadic animals may be the descendants of those left on the island by a British merchant after being confiscated from Acadians by opposing forces. However, given the number of shipwrecks dating from the 1500s, along with former human settlement attempts, theories vary. By the end of the 16th century, the island, comprising sand, low-growth vegetation and freshwater ponds, is said to have been inhabited by shipwreck survivors, sealers and salvagers. Since then, horses were periodically removed, mainly for commercial use, but in 1960, the government implemented protection policies. Once Larson was granted access to the protected historical site, she took a hotel in Halifax and, with three others, shared the $10,000 cost of hiring a charter plane. Her planned five-day visit was shortened to two days. The island, populated by a half-dozen people, has no stores or restaurants. Before landing, a Coast Guard member packed the landing strip. “He drove his truck over it about 20 times,” says Larson. Another memorable experience occurred when a younger stallion approached the camera’s tripod. Cautiously investigating the device, he nudged it a few times and finally sent it to the bottom of the pond. The Sable Island exhibit can be viewed at Creekside Studio until July 3. You can call the studio toll-free at 1- (800) 251-9246. Contest Winner – Congrats Aleshia! No longer Unnamed! This painting is now called Sable Spirit - Congrats Aleshia! First, I wish to thank everyone that took the time to enter our “Name the Painting” contest. It was a truly difficult task to narrow down the list even to the top contenders. A small group of friends and family spent many hours between last night and today going over the list many times . . . inevitably the last choice was mine to select “the one” from the many. “SABLE SPIRIT” entered by Aleshia Kiedaisch . . . congratulations Aleshia!! It has also now been posted under the contest tab on this blog. The wonderful response to these paintings tells me that, although tiny, Sable Island and its wild horses hold a large place in the hearts and imaginations of Canadians. I would like to invite you to suggest other titles for paintings in this series. I may not be able to respond personally to all of you, but I will pay attention. 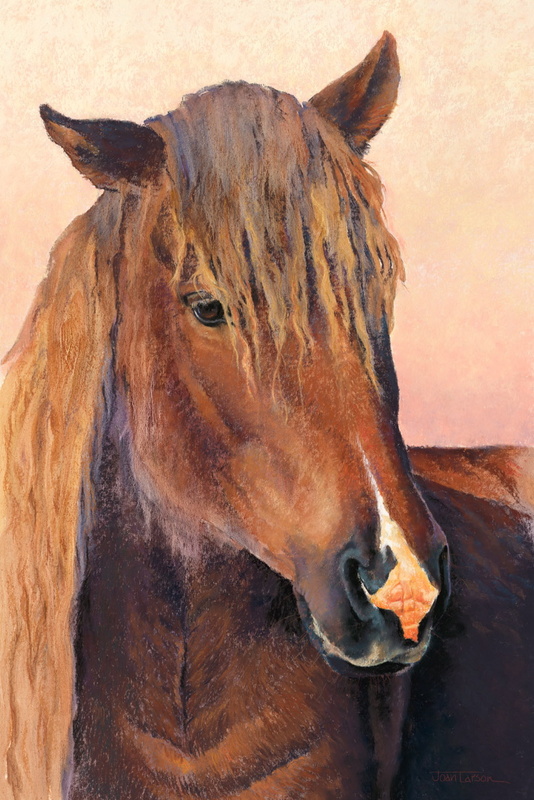 The new paintings will be posted as they are finished on my Sable Island Horses blog. We extended the Show too! For those of you that live in proximity to my studio, we have had so many people calling and asking if they can come out to the studio to see the paintings that we have extended the show. The show and studio will be open daily from 1-5 pm until end of day on Sunday, July 3rd, or by appointment by calling us at 1-250-752-0395. A most humble and heartfelt “Thank you” to all. Unnamed...but not for much longer! Our contest is now closed for entries but Wow, you people have been incredible!!! Thank you to everyone that has taken the time to send in your entry. I am overwhelmed and humbled by your responses. There have been 257 names entered . . . and I can only pick one. But let me tell you what has happened because of this . . . some of the names suit the other paintings in the series and some of the names have actually sparked new paintings in my head!! This entire “Sable Island” series is just getting started. I have just spent the last 2 days (at our opening here at the studio) talking non-stop about Sable Island. The stories and aura of this magic island and its horses have completely captivated me. 20 paintings is a good start! SO, if you would like to suggest titles for any of the other paintings, please feel welcome to do so. I may not be able to email each of you personally to thank you, but please know that I appreciate each and every suggestion. I believe that “TIME” is the only thing any of us really ever have to spend, so I most humbly thank you for your time and consideration. The winner of this contest will be posted later today. Thank you. PQ News reporter Lissa Alexander wrote and wonderful article in the local paper about my trip to Sable Island and about my upcoming show at the Studio this weekend! Thanks so much Lissa, it’s a beautiful article! 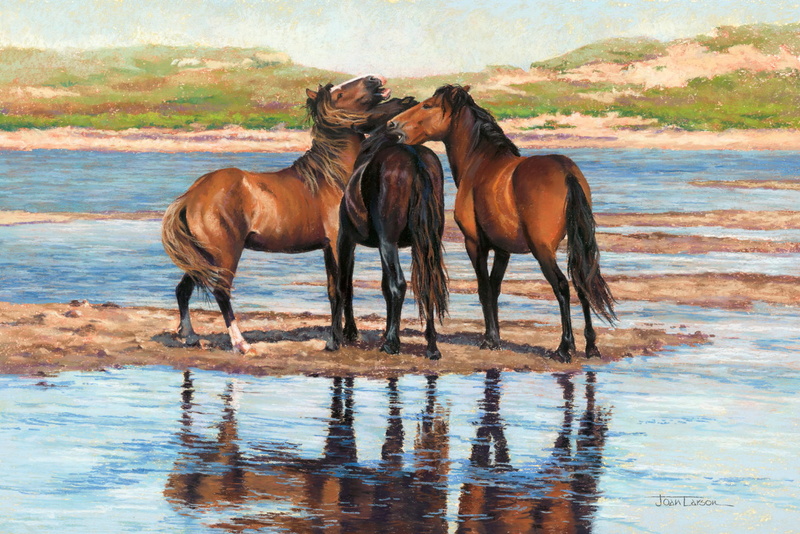 After a profound visit two years ago to a secluded, East Coast Island, Coombs artist Joan Larson has finished her Wild Horses of Sable Island series, enabling residents to discover this hidden Canadian gem for themselves. Larson had known about the ethereal sand bar island since she was a child; heard the romantic stories of the wild horses, the sandy plains and beaches and spectacular sunsets, but never thought it would be possible to visit herself. Access to the island has to be granted by Canadian Coast Guard and visitors have to make their own transportation arrangements to and from the island, as well as bring all their own supplies. Larson was invited by a childhood horse riding acquaintance, and was thrilled by the invitation. “It was just like, ‘Oh my God are you kidding?’ when she asked if wanted to go,” Larson said. “To go and hang out with a bunch of wild horses?” she added. So she headed off with two photographers and an Alberta professor and wild horse researcher. The island, located 300 kilometres southeast of mainland Nova Scotia, is the windiest place in Nova Scotia with the least sunshine and most fog. That’s why it wasn’t surprising to Larson when she and her group were grounded by offshore fog, delaying their week-long trip for five days. In the end the weather also delayed them getting back to the mainland, giving them four full days on the island. Before the wheels even hit the landing strip (which was the beach) Larson saw wild horses coming out of the dunes. The population of horses on the island swelled to about 400 when she was visiting and she said it wasn’t hard to find them on the 42 km long island. Only a handful of people reside on Sable Island, but the wildlife is a different story. Besides wild horses, the island is also home to the world’s largest population of grey seals, along with harbour seals and numerous birds. One evening that remains ingrained in Larson’s memory was the first night she spent on the island, having hiked to a beach to watch an incredible sunset on a balmy summer’s day. “I was sitting in the sand dunes and there’s horses behind me, there’s seals up and down the beach and I just had this profound sense like the universe came down and gave me great big hug,” she said. Larson has created 20 original paintings based on her experiences on Sable Island, revealing captivating scenes of the island’s wild horses, sand dunes and sunsets, all in pastel. She said the Island was a magical place and she wanted to capture and express this in her work. “To me this is about sharing a little slice of Canada that hardly anyone will get to go visit in person,” she said. The Wild Horses of Sable Island will be featured in an art exhibition and sale at the Creekside Studio, located at 1471 Winchester Rd. in Coombs this Saturday and Sunday, June 18 and 19 from 10 a.m. to 5 p.m. For details about the artwork and show visit www.joanlarson.com/sableisland.html or call 250-752-0395. A “Name That Painting” contest is happening for one of the pieces, visit https://joanlarson.wordpress.com/contest/ for more information. Brian Zimmerman, owner and creator of the extraordinary Woodland Gardens, invited me to be the Featured Artist. I were very pleased to be part of this show! There is a wonderful and relaxed atmosphere among the visitors and artisans like. My husband, Paul, and I met some great people, including MP John Duncan and his wife Kim. You can see their website for yourselves…but I highly urge you to check out Woodland Gardens if you are near, or passing through Courtenay. 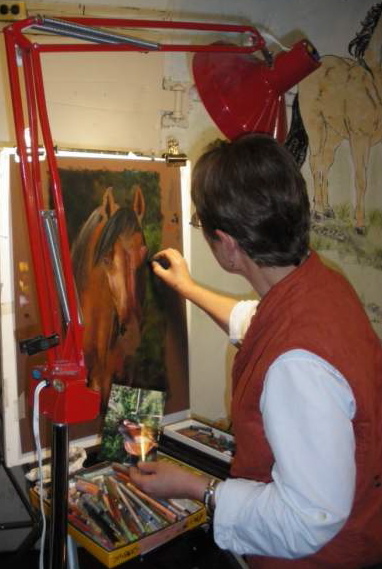 I have worked as a full time professional artist for 20 years specializing in equine art. When I am asked which is my favourite painting, the only way I can possibly respond is to say "the one that is on the easel." Enter your email address to subscribe to Joan's "From the Easel" and receive notifications of new posts by email.